A Sense of My Ending/How Will I Later Recall Writing and Promoting Pieces of Me? I saw the movie The Sense of An Ending recently, and this quote jumped out at me. “How often do we tell our own life story? How often do we adjust, embellish, make sly cuts? And the longer life goes on, the fewer are those around us to challenge our account, to remind us that our life is not our life, merely the story we have told about our life. Told to others, but–mainly–to ourselves.”– Julian Barnes, The Sense of An Ending. The last sentence. –Told to others, but–mainly to ourselves,” really sticks. As I wind my way through different towns and states promoting my memoir, talking to many wonderful others, I think about how I’ll remember this process in my final memoir. 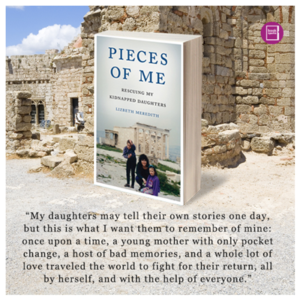 I suspect it will be published in my seventies if I’m fortunate enough to last that long, covering the process of healing where the last book left off, following getting to know my extended family, and the publishing my first book. What will I think then about this process of storytelling when it’s a memory? I borrowed heavily from old journals, newspaper articles, and ingrained memories of awful events to write Pieces of Me. What comes later will be different, a more normal life. What I hope old Liz will remember to tell about the one in her fifties is that both writing and promoting her book was a complicated process. Not glamorous as imagined in years past. Filled with extreme solitude and then extreme socializing. Many sleepless nights, worried about the feelings of those included in the book and those who weren’t, and hoping I did due diligence at each event to make it worthwhile, gnawing concerns about money, thank you cards needing sent, and emails needing care. And I hope the old gal will remember that in the midst of all that, there was an outpouring of love and support from family, friends, and strangers, and that people were empowered to tell their own stories, because a sacred atmosphere of vulnerability is created in writing memoir, and an understanding that everyone has a story, and every one of our stories is indeed important. On this current trip, I’m so grateful to the University of Washington Bookstore and their staff, to friends and family and strangers who came out to show support, to my new friends I made at the Seattle hostel, and to King5 News for covering my book and the event. I loved seeing my dear friend Ira, who found my father for me so long ago. At the University of Toledo’s Catharine S. Eberly Center for Women, I’m grateful to the passionate staff for including me in their mission to empower women, and for creating an elegant event that was covered by WGTV13abc and filmed for university students for later video streaming. I adore my friend Billijo for driving from Minnesota to Ohio to join the event and spend time with me before and after. And great thanks to my friend Jennifer Jarrett for coordinating this, and for tonight’s Meet the Author event at Luna Pier in Michigan and for being my host family. I’m indebted to my youngest daughter for caring for my home and cats and for her work to stop the flooding in my kitchen after a pipe broke. If you’re interested in telling your story, I’ve long enjoyed the National Association for Memoir Writers. There are free coaching sessions run by Linda Joy Meyers, a therapist and author. It’s a gentle way to get your feet wet.